We are right in the middle of Prayer Truck, and our team is having all kinds of wonderful encounters with neighborhood folks in our street level sanctuary. Kirk especially loves the Prayer Truck, and is out every night till midnight sharing the gospel and praying for people. We are finding that our investment in the neighborhood over the last couple of years is really beginning to pay off. Lasting relationships are being made, many of which started at the Truck! Since this time last year, our team has almost doubled. They say “work your strengths and staff your weaknesses”. I guess I must be a pretty weak person, because God has brought to us a group of very gifted and skilled individuals to join in the mission of God through GOHOP. What that means for me is a shift in focus in this next season. I will be doing more leadership development, management, and putting the appropriate systems in place so that we can serve our team well so they can minister effectively in the prayer room and in the city. Please pray for me for wisdom and God’s strategy to help the team continue to be fluid and flexible, creative, and responsive to God’s initiative as we grow. As soon as Prayer Truck is done, Kirk and I will be taking 2 weeks away at a family cottage for a much needed rest. 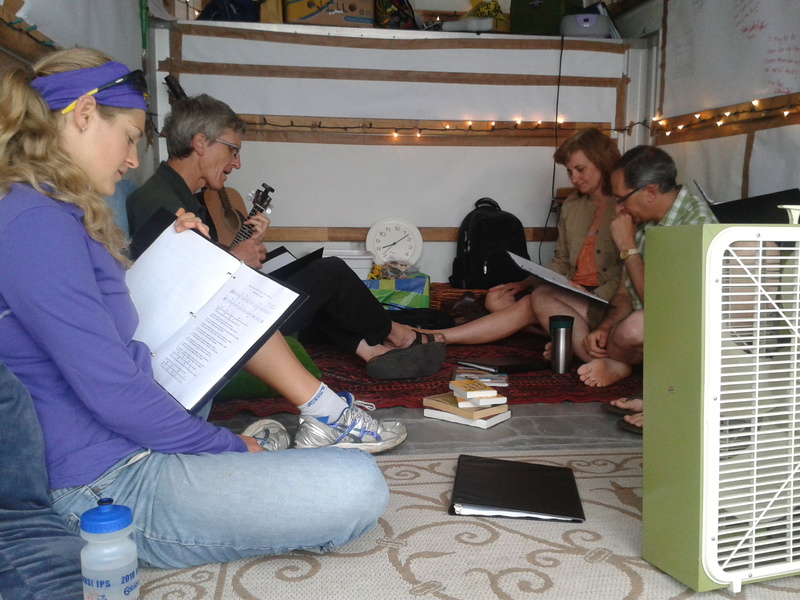 Then Hannah and I will be flying to Vancouver for a bit more rest with my parents, and some skills development for me with the 614 Urban Monastic Community in the Downtown East Side in Vancouver. “What about the fall?” you ask. Last month, I’m at my ministerial meetings, and my friend and colleague, Gordon, prophesied over me. What Gordon did not know (in the natural), is that Hannah and I, along with several members of our GOHOP team, are going on pilgrimage to Ireland and the UK in October. 24-7 is having its International Gathering in Dublin. GOHOP has been in dialogue with 24-7 for a couple of years now about GOHOP becoming one of their official Boiler Rooms. Consequently, as part of those negotiations its imperative that I attend and meet the international family. And since we’re going all the way across the Atlantic, we decided to expand the pilgrimage to visit ancient and modern monastic sites in Ireland, Scotland, and England including Iona and Bangor. Along the way we will be visiting the 24/7 Boiler Room Communities of Guildford and Stanford. We will be praying. Meeting our UK and Irish 24-7 family in their communities, learning from one another. We feel that Hannah is supposed to accompany me on the journey. The cost for Hannah and I to go on this trip will be about $6000 for the two of us. If you feel like you would like to help us along the way you can give online at www.canadahelps.org, or send cheques made payable to GOHOP to Box 1617, Burlington ON, L7R 5A1. The night is warm and musky. I sit at the foot of a tree, nestled in between the roots. Apart from the hum of an occasional mosquito, all is quiet. 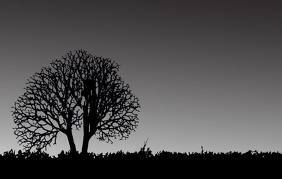 Up the hill I can see tree silhouettes, standing sentinels in the night. I’m fourteen, and this is my first youth retreat. I was drawn by the water skiing, para sailing, and a handsome counselor that could have been Sting’s twin brother, rather than any sort of spiritual hunger. “Go out somewhere by yourself and pray”, they said, earlier in the evening. So here I sit. Pray? Other than reciting the “Our Father” in school, praying was something that had never occurred to me, and something that I had no idea how to do. “Um hi, I’m Jill“, was all I can think to say. And suddenly the darkness coalesces. Something invisible yet palatable settles around me. And then all of a sudden, afraid. Afraid of the invisible Presence. Afraid of my alone-ness and now suddenly not alone-ness. I hop up and make a beeline for my cabin. The next day they share the Gospel. Would I give myself to Jesus? Duh, of course! I met Him last night under the tree! The rest, they say, is history. And it started with a simple invitation to begin the conversation. Last week, I asked some friends to tell me about the first time they remember praying. It’s my conviction that conversation leads to conversion. When we acknowledge His presence, and start to speak with Him, He begins to reveal Himself in wonderful ways. 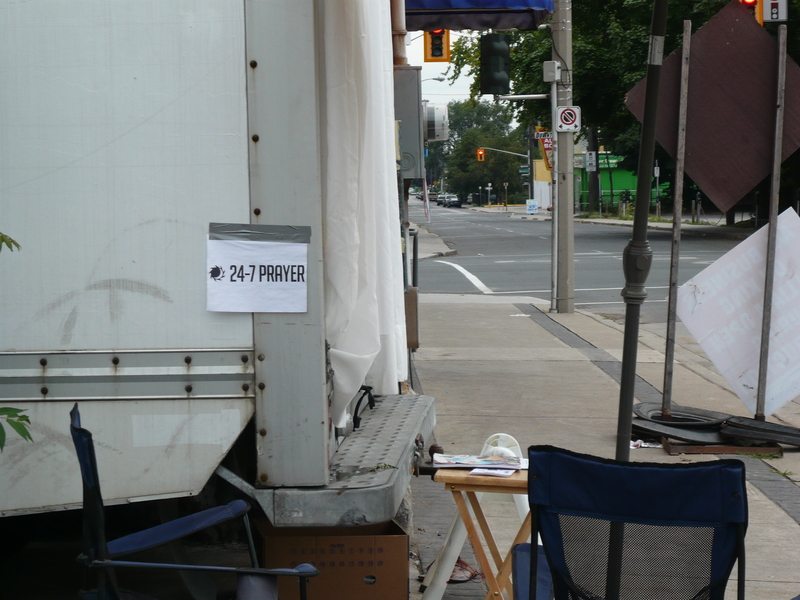 Which is why I love 24/7 Prayer Rooms and adore the Prayer Truck. Here we are, sitting in a truck. In an alley. A street level sanctuary. Day in, day out. Inviting people to start the conversation. “I don’t go to church, I don’t know how to pray.” We hear that all the time.